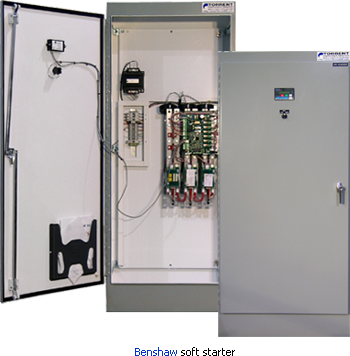 Torrent Engineering and Equipment utilizes digital soft starters to lower energy costs, increase motor life and reduce overall system stress. A motor soft starter is a device used with AC electric motors to temporarily reduce the load and torque in the powertrain of the motor during startup. This reduces the mechanical stress on the motor and shaft. The electrodynamic stresses on the attached power cables and electrical distribution network are also reduced, extending the lifespan of the system. Digital soft starters utilize solid state devices to control the current flow and therefore the voltage applied to the motor. One of the benefits with the soft start method is the ability to adjust the torque to the exact need, whether the application is loaded or not. In principle the full starting torque is available, but with the big difference that the starting procedure is much more forgiving to the driven machinery, with lower maintenance costs as a result. During the stop sequence a soft starter is a better solution. Without a soft starter, disengaging a contactor results in the motor stopping too quickly. As an example, in a pumping application and depending on high mass flow in the pipe system, the water will continue with the same speed for a short period and then will travel backwards in the pipe system. This creates high pressure shocks on valves and high mechanical stresses on the pipe system. The soft starter reduces the voltage during stop via a voltage ramp and the motor becomes weaker and weaker. Because of this the water speed slows down very smoothly without creating any shock waves. A special function on the soft starter is sometimes available, called "step-down voltage", which ensures an optimum setting to the actual need for any pipe system.